Ghosts, a kidnapping, a crew of young detectives, and family secrets mix in this new standalone mystery set in the world of the bestselling Greenglass House, from a National Book Award nominee and Edgar Award-winning author. Marzana and her best friend are bored. Even though they live in a notorious city where normal rules do not apply, nothing interesting ever happens to them. Nothing, that is, until Marzana's parents are recruited to help solve an odd crime, and she realizes that this could be the excitement she's been waiting for. 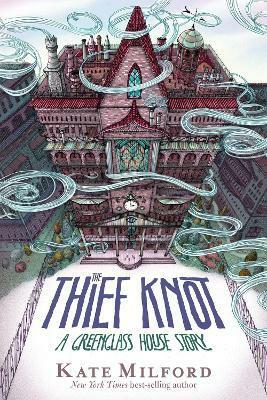 She assembles a group of kid detectives with special skills--including the ghost of a ship captain's daughter--and together, they explore hidden passageways, navigate architecture that changes overnight, and try to unravel the puzzle of who the kidnappers are--and where they're hiding. But will they beat the deadline for a ransom that's impossible to pay? Legendary smugglers, suspicious teachers, and some scary bad guys are just a few of the adults the crew must circumvent while discovering hidden truths about their families and themselves in this smart, richly imagined tale. Kate Milford is the New York Times best-selling author of the Edgar Award-winning, National Book Award nominee Greenglass House as well as Ghosts of Greenglass House, Bluecrowne, The Boneshaker, The Broken Lands, and The Left-Handed Fate. She lives with her family in Brooklyn, New York.